Heavy crude oil is a type of crude oil that is deﬁned as any liquid petroleum with a viscosity more than 50 centipoises and a reservoir viscosity between 1,000 and 10,000 centipoises. Because its high viscosity and freezing point, it has not been the focus of crude oil production for a long time. But, as the crude oil depletion becomes worse, the production of heavy crude oil would play a more important role in the future. It is discovered that the viscosity of heavy crude oil changes signiﬁcantly by its temperature. Thus, thermal extraction is the major method of heavy crude oil extraction right now, which efﬁciently increases the temperature of oil reservoir and reduces the viscosity of heavy crude oil. The thermal extraction process includes cyclic steam stimulation, steam ﬂooding, steam assisted gravity drainage, hot water ﬂooding, in situ combustion and electromagnetic extraction. Among them, in the process like cyclic steam stimulation, steam ﬂooding, steam assisted gravity drainage and hot water ﬂooding, water heating is required, usually by burning crude oil or natural gas for now, to generate steam or hot water. Furthermore, the heavy crude oil is preserved within a given temperature range in order to keep its liquidity in the processes of transportation and preservation. It is investigated that at least about 20% of natural gas is used to heat and process crude oil in extraction and transportation, which is obviously an enormous waste of natural gas resource. CSP technology could play a signiﬁcant part in the thermal extraction of heavy crude oil, because it is able to reﬂect a large area of sunlight into a small area, and use the concentrated light to heat water to generate steam or hot water as required. 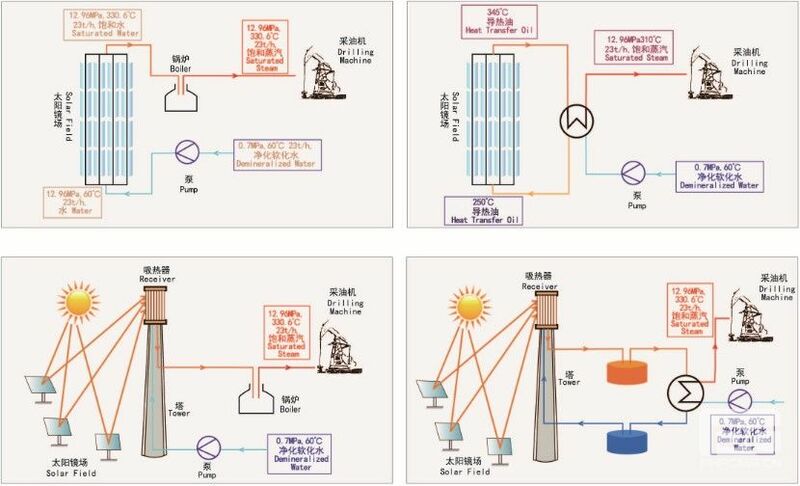 And Solar Power Tower and Parabolic Trough are commonly used in the thermal extraction of heavy crude oil. SunCan's team has proven expertise and experience in CSP technology and provides customers with services including system integration and EPC of Solar Enhanced Oil Recovery systems.